Zach Wallace in the field with a golden eagle. Photo by Mike Lockhart. Join us for our October Draper Natural History Museum Lunchtime Expedition lecture. Zach Wallace of the Wyoming Natural Diversity Database (WYNDD) presents Golden Eagle Conservation in the Wyoming Basin Ecoregion. The talks in this series are free, and take place in the Buffalo Bill Center of the West’s Coe Auditorium. The Wyoming Basin Ecoregion is among the highest quality habitats for golden eagles in North America. Vast and relatively undisturbed sagebrush steppes, diverse topography, and abundant prey populations make the Wyoming Basin a stronghold for this iconic raptor. Human activities and expanding development of natural resources in the Wyoming Basin present both challenges and opportunities for the conservation of golden eagles and their habitats. Zach Wallace has spent several years compiling data and literature on golden eagles in the Wyoming Basin as part of an effort by the U.S. Fish and Wildlife Service to develop an ecoregional conservation strategy for the species. His presentation reviews the state of knowledge on golden eagle ecology in the Wyoming Basin and explores new model-based maps and tools designed to support broad-scale conservation planning and promote the long-term coexistence of golden eagles with humans and economic development. Zach Wallace is a wildlife biologist whose work focuses on human impacts to wildlife and their habitats, with an emphasis on raptor ecology. He has studied wildlife across the western United States, including extensive work on golden eagles in the intermountain west and desert southwest. 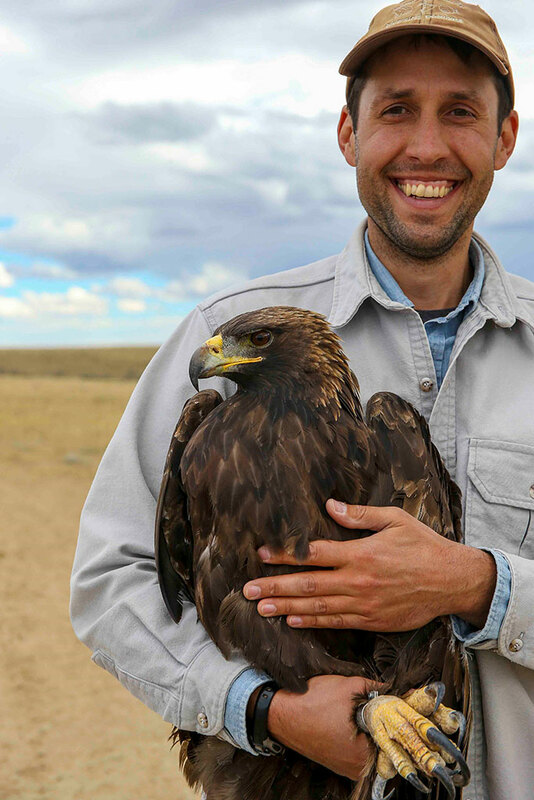 He received his master of science in Wildlife Science from Oregon State University, where his research focused on the nesting ecology of ferruginous hawks and golden eagles in Wyoming. After completing his graduate degree, Wallace worked with Eagle Environmental, Inc. as a consultant to the U.S. Fish and Wildlife Service, industry, and Native American tribes on the effects of human activities such as wind energy development and religious harvest on golden eagles. He continues this work at the University of Wyoming as a zoologist for the Wyoming Natural Diversity Database, where his research also includes field studies and analyses of vertebrate species of concern, from amphibians to songbirds to bats.